Guess what, ladies? Your lab coat doesn’t have to be something that you dread putting on every day. You don’t need to wear what is essentially a glorified smock that is neither comfortable or flattering for your 14-hour work days. As a matter of fact, there are now tons of options for lab coats that you might even look forward to putting on each morning! Worn in the right style, a flattering lab coat is actually a fashion piece. For instance, the limited edition Miranda B. lab coat from Medelita has taken your standard medical apparel to the next level by offering the most form-flattering style for ladies. Vertical contouring: the lines of the seams on this lab coat are curved to match the curves of real women’s bodies. This way the lab coat serves to hug you at the narrowest point of your waist. The result? A to-die-for hourglass figure that is still professional. Darting and pleating: these little design details go a long way in creating a polished appearance. Medelita has purposefully reinvented this coat as an emblem of confidence and poise. Back skirting: the first lab coat in history to have a skirted back, this delicate feature is beautifully delicate and unique. 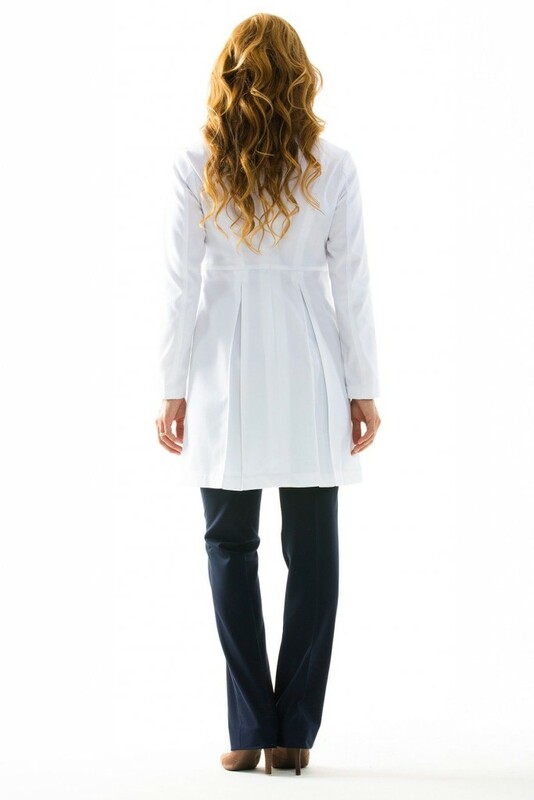 The skirted back of the Miranda B. is the most feminine design for a medical lab coat available on the market. This entry was posted in Lab Coats, Women's Lab Coats and tagged Design Details, Lab Coats For Women on May 4, 2016 by Ariel Jacoby.